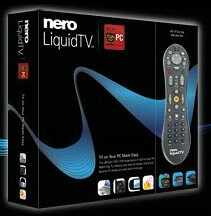 A Tivo Home Theater PC software called LiquidTV is coming in October thanks to the partnership with consumer electronics maker Tivo and software maker Nero. 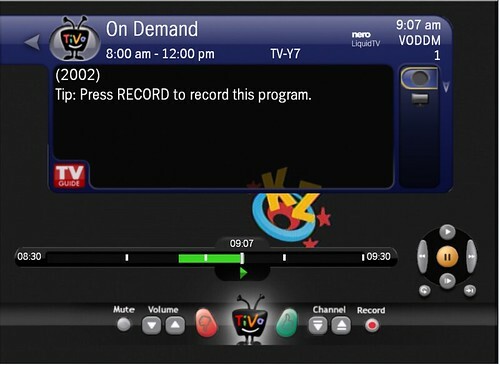 The software application will provide the TiVo experience on personal computers allowing users to record shows onto a computer hard drive, move content between their TiVos and computers and record and format videos so that they can be synced to their iPods and Playstation mobile devices or archived onto DVDs. Next a retail box version with the TiVo Peanut remote control, IR blaster/receiver, and a Hauppauge HVR-950Q USB TV tuner card will cost $199.99. The service will then costs $99.99 per year after the first year. The software will be available for a free, 30-day trial before purchasing. Tuner Support: Officially supported tuners are listed on the TiVo LiquidTV website, but they are saying that any tuner with a BDA driver should work fine with the software. # of Tuners: The software will support up to four tuners but only one of those tuners can be a set-top box. System Requirements: The LiquidTV PC requirements are a bit higher than with Snapstream’s BeyondTV or SageTV. Requirements include 3.0GHz Pentium IV or AMD Athlon 3200+, 256 MB Ram (512MB for Vista). All in all the requirements are in line with what I would recommend for a HTPC these days anyway, but it does leave out those with older PCs. You can view the entire list of system requirements on the LiquidTV website. Remote Control & Mouse Control? Can be controlled with a remote control if you have an IR receiver or using the computer mouse. DRM and content protection? It hasn’t been confirmed, but you can bet that TiVo will use content protection “flags” on this software that prevents the recording, copying and manipulation of “flagged” programs – just as they do with their other TiVo products. TiVo Extras? LiquidTV does support wishlists and KidZone, but no support for other TiVo extras like Amazon Video-on-Demand, TiVoCasts, podcast support, Internet radio etc. 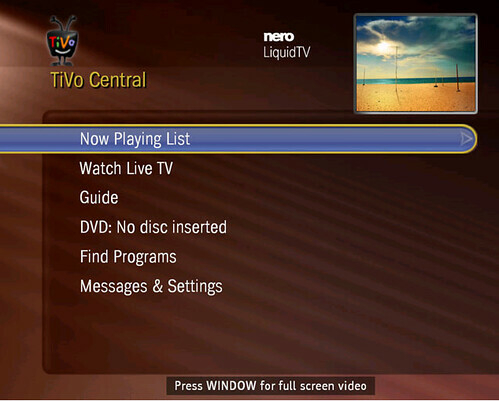 Can the TiVo view recorded content streamed from LiquidTV & vice versa? Yes, as long as they’re both connected to your home network. Can the TiVo view liveTV streamed from LiquidTV & vice versa? No, it will work just as the current TiVo devices today where the tuners and settings are independent of each other. No server/client architecture is built-in as is available on SageTV and BeyondTV. CableCard Support? Initially at least there will be no cablecard support. It is possible, although unlikely that users might be able to purchase preconfigured CableCard PC’s just as Vista Media Center PC users can today. Hauppauge HD-PVR Support? It is very unlikely that the new software will support the Hauppauge HD-PVR component capture device (allows you to record all channels including those that are encrypted) as the support for H.264 files is not there for the new TiVo software. Add to that the fact that TiVo doesn’t want to upset the content providers by offering “unprotected” media to the user. Launch Date in US: LiquidTV is set to launch in the US, Canada, and Mexico on October 15, 2008. Launch Date in Europe: LiquidTV is set to launch in Europe in 2009. So it’s obvious that TiVo is attempting to wean those who use or might choose one of the leading software-based PVR programs away from those competing programs and onto the TiVo pay-for-the-guide service. That being said, I expect this software to be a small-time player in the HTPC world. While I imagine there are several current TiVo owners who want to extend their TiVo interface to the PC, I don’t see this product appealing in the niche market of Home Theater PC software. Having the TiVo interface likely sounds pretty good to many people, but I’m betting we’ll see lots of complaints from early users as Nero works to make the software stable. I’ve been involved with HTPC software for many years and I can tell you it is a very difficult thing to support. You’re dealing with multiple PC configurations, multiple levels of tech understanding in your users and the sometimes finicky PC. Most HTPC software companies have spent years getting their software to the point that it is stable and solid enough to gain the trust of the common TV viewer. It will have the TiVo name and very similar interface, but it can’t have the same reliability and support being a software product. To me it seems like TiVo is going backwards on the HTPC concept where a PC makes a great HTPC/PVR server (expandable, upgradable, hideable) and the low-configuration hardware device (aka extender or tivo box) makes a great device to extend to the Television. Instead, TiVo is moving the opposite direction with LiquidTV. Obviously this isn’t a move to make all TiVo users HTPC users, but more a move to hook some of those HTPC users into their simple, well-designed TiVo UI. Another major point against this software is the cost. Why would someone pay $99 a year for the software TiVo when they could get the hardware TiVo that probably works better, tunes more channels and will undoubtedly get better support for not much more initial cost?